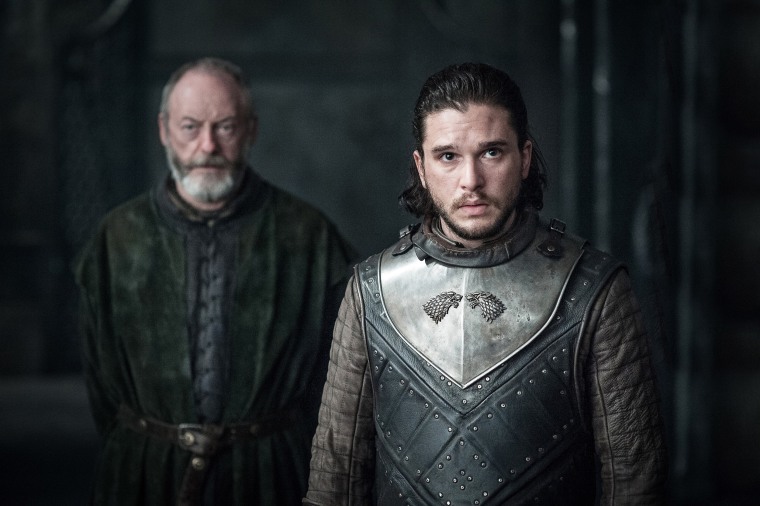 LOS ANGELES — This Sunday's episode of "Game of Thrones" has been stolen and posted on the internet — but the leak isn't related to the massive hack of HBO's systems disclosed earlier this week. Links to the fourth episode of "Game of Thrones" season 7, set to premiere Aug. 6 on HBO, appeared on a discussion board on Reddit, as first reported by the Verge. The pirated copy of the episode, titled "The Spoils of War," was available via Google Drive, according to the report. However, shortly after the link to the "Game of Thrones" episode was posted on Reddit at 8:12 a.m. ET Friday, the post was updated with this message. "The file has been taken down for violating GoogleDrive's [terms of service]. You can no longer view it." It's not the first time "Game of Thrones" — believed to be the most-pirated TV show of all time — has been hit with pre-release piracy. In 2015 the first four episodes of season five landed on piracy networks, after being copied from review screeners, nearly a full day before the season premiere. During last year's season-six run, an episode leaked ahead of its premiere date after it was accidentally made available on HBO Nordic. But the leak came from pay-TV distribution partner Star India, a subsidiary of 21st Century Fox, whose logo appears as a watermark in the pirated copy with the text "for internal viewing only," the Verge reported. "We take this breach very seriously and have immediately initiated forensic investigations at our and the technology partner's end to swiftly determine the cause," a rep for Star India said in a statement. "This is a grave issue and we are taking appropriate legal remedial action." Mumbai-based Star India operates more than 40 channels in eight different languages. The Verge said it was able to verify the authenticity of the leaked "Game of Thrones" episode; Variety has not independently confirmed that. The leak comes after HBO confirmed Monday that hackers breached the premium cabler's networks, reportedly stealing 1.5 terabytes of documents and files. The cybercriminals released the script for the Aug. 6 "Game of Thrones" episode, along with episodes of "Ballers," "Insecure," "Room 104" and with two episodes of "Barry," the comedy starring Bill Hader set to debut in 2018 on the network. A security company hired by HBO to scrub search results for the hacked files from search engines told Google in a takedown notice Tuesday that the hackers stole "thousands of Home Box Office (HBO) internal company documents." In a memo to staffers Wednesday, HBO chief Richard Plepler said the hackers did not compromise the programmer's e-mail system "as a whole" but added that "the forensic review is ongoing."